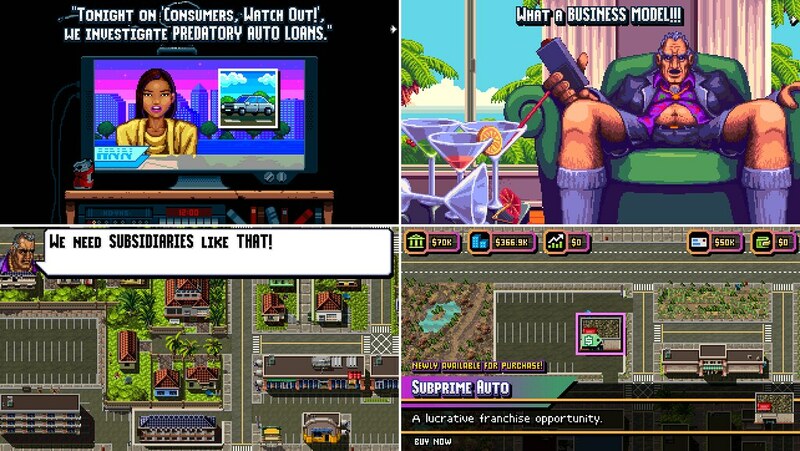 The new game from Retro City Rampage creator Brian Provinciano introduces an aging antihero to the wonderful world of business acquisition. ‘Shakedown: Hawaii’ was first announced right here, a year and a half ago. I had no idea what everyone’s reaction would be, knowing that after Retro City Rampage, each of you would have your own picture in mind of what the next game would look like. I hoped that whatever that was, it would line up with what Shakedown is. So with that said, I couldn’t have been happier (and relieved) with how well it was received. Having explored so many different potential art styles with so many different artists, it looked like I’d ultimately chosen the right one. The new music direction went over super well too! Since then, I’ve been busy at work on the game, and it’s come a very long way. It’s a new game, not Retro City Rampage 2, so there was a lot that had to be built. During that time, I’ve trickled out teasers, but they’ve only given you a peek at the art style, music, and the destructible environment. 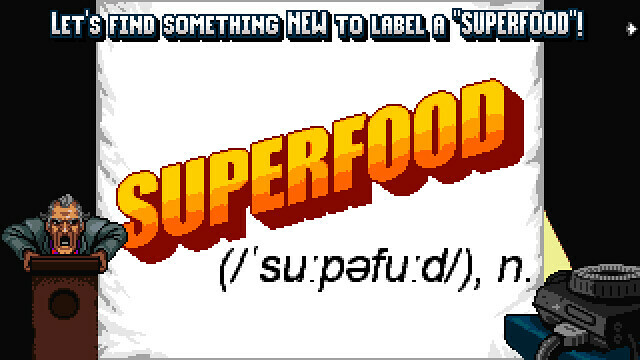 Today, the game’s finally fully revealed – its theme, story, protagonist, and… business acquisition metagame! Out of Retirement… to Retire the Competition! You play an aging CEO, stranded in a world he no longer understands, with a company that’s now a relic of the past. Upon discovering that online shopping’s destroyed his retail margins, ride sharing killed his taxi business, and video rental stores… are no longer actually a thing… it becomes clear that keeping the company alive will require drastic measures. He’ll need to modernize the business! Unfortunately, the modernizations he chooses are exactly those comically egregious practices! Replacing the genre’s more commonly populated gangs and mobsters, are boardroom executives, formulating harebrained schemes to increase margins and boost profits. But, whether you’re cornering the market on avocado toast or masterminding new hidden service fees, the missions ultimately unravel into the same carjacking, combat and shootouts you’d expect from the genre. As things begin to turn the corner, our anti-hero sets his sights even higher. Perhaps it was his rival’s taunts, or maybe he attended one too many motivational self-help seminars, or it could just be his own insecurity and over-compensation complex. Whatever it was, he declares that saving the company is no longer enough. He’s going to own the ENTIRE island! He’ll destroy EVERY competitor! He’ll convince the world that online shopping’s a dying fad, taxis are here to stay, and dammit… get everyone renting VHS tapes again! The entire island is up for grabs… or at least, will be once you ruffle enough feathers. Through story missions, small jobs and your own acquisitions, you’ll gain ownership of properties and businesses. The revenue they generate can then be funneled back into more acquisitions. Our anti-hero’s decision to spend more time on reality TV as a “CEO” personality, than as the actual CEO of his company didn’t help matters. Even though he’s only reached D-list celebrity status, he’s still too recognizable to go on a rampage without a disguise. Luckily he owns a few costume shops in town. New opportunities will emerge as your empire branches out into new market segments. With the disguise, you can begin sabotaging competitors, threatening those who threaten your brands, and collaterally “rezone” land. With your trusty disguise, you can also begin shaking down shops for protection money, and use that to fund your “legitimate” corporate expansion. 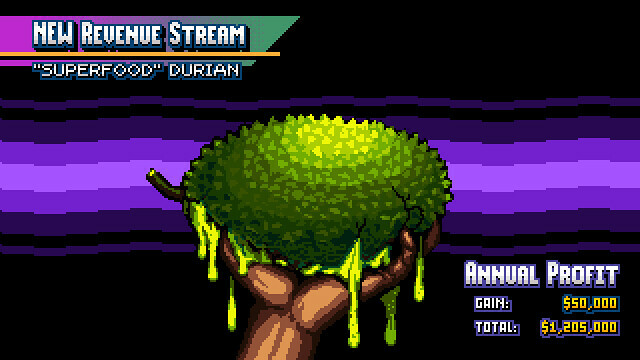 These micro missions are scattered all over the island and successfully completing them will provide you with additional streams of income. More on these shakedowns will be revealed in detail in a later trailer dedicated solely to their part in the game, so stay tuned! So there it is! That’s Shakedown: Hawaii! Now that we’re past the teaser stage, look forward to much more frequent and meaty trailers, showcasing specific missions and characters, the world and shops, character customization, plus more of the soundtrack (composed by the incredible Matt Creamer, AKA. Norrin Radd). 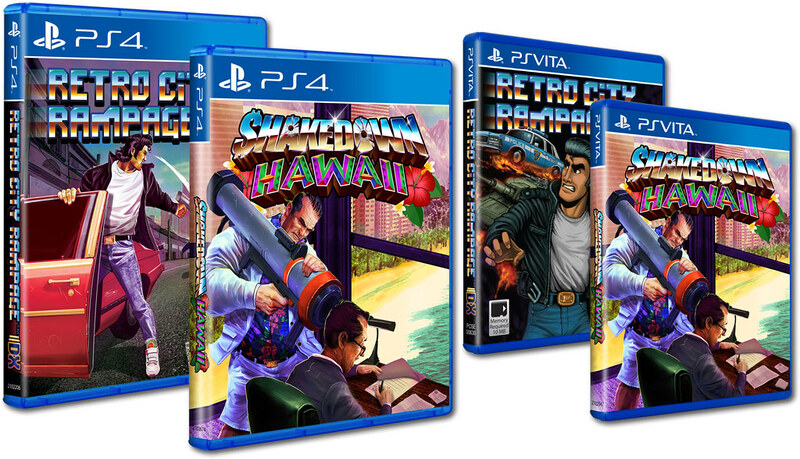 Although there’s no release date just yet, Shakedown: Hawaii will be Cross-Buy and land on both PS4 and PS Vita! Continuing the trend, I’ll also be self-publishing physical copies! Be sure to subscribe to email alerts so you don’t miss ‘em! Also subscribe to be notified as soon as the release date’s announced, and when major news or trailers drop! I look forward to hearing your thoughts in the comments below, and am here to answer them! Hey everyone! I’m here to answer your questions! Look forward to hearing what you think! I’m excited to play,but wasn’t this announced as a timed Nintendo Switch exclusive at first? Did something change? I’m definitely getting this physically for the Vita…. Oh, who am I kidding? I’m probably going to double dip and get it digital as well. This game looks amazing. Thanks Brian for your constant support of the Vita. I will buy this for my PSVITA. I do like the island takeover gameplay. Wow, looks great! I will definitely buy this for my PS Vita. This looks so fun and cross-buy is a huge perk! Any chance there is cross-saves as well? Thanks, and well done! Will the physical releases be close to the digital launch? I want that Vita version to go with my RCR DX copy. It’ll probably be a little after launch. More lead time required for manufacturing. I’ll keep everyone posted as I know more about the timeframes. This looks amazing! Can’t wait to play this and get it physically if I can. Also, for the trophy lovers out there, will this have a platinum? I’ll be begging Sony for one, but can’t make any promises just yet. Fingers crossed though! I want it to have one too! I’m a huge fan of Retro City Rampage and have been looking forward to this game for a long time. Getting it no matter what! i have a question: since i’ll buy both versions of the game, any collectors or limited editions for the ps4 physical edition like last release? Looking into various cool things I could do for it, but nothing carved in stone just yet! Are there any plans to do a reprint of RCR on Vita? There might be, with the PS4’s new cover art to differentiate it, but nothing in the works right now. Perhaps after Shakedown. Would love to one day, maybe with the next game, but since I’m still just one guy I’m focusing 100% of my efforts on making the single player as polished as possible. It looks like A LOAD OF FUN!!!! Will be getting it day one for Vita! 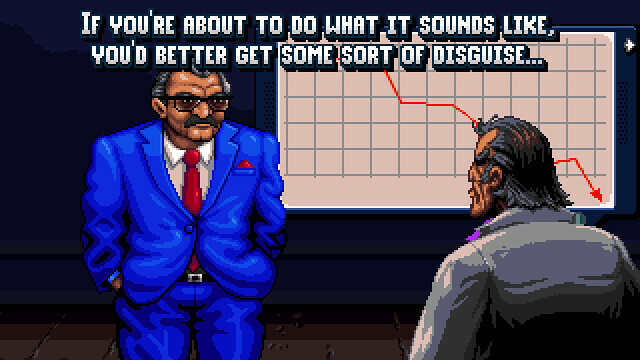 Another question: is this the same character from Retro City Rampage, but older, or a new character? Early on, the character was going to be an older version of RCR’s Player, but since the game wound up so different (no references, etc. ), it made more sense to make it a different character..
That’s why I asked. Thanks for clearing that up. Thank you for supporting the Vita! There are some funny business names, but they’re not references like they were in RCR. Different roots. This sure looks fun! But just how toned will my thighs get while playing it? so Brian you did not answer the first question is was suposse to be switch exclusive first ?? and for how long. remember PS4 and VITA are were are the first fan base. He actually did. He said there was a miscommunication and nothing is sorted with the launch yet. He wants to finish it first. Thanks for supporting the Vita! Reminds me I still need to finish the 1st one. I enjoyed it on PS3, PS4 and Vita. AT LAST! I’ve been waiting for more news on this! Very glad to hear that a Vita release is still on the cards, especially a physical one!!! This guy is the real MVP with self-publishing physical copies! I have to go back and finish RCR on Vita. Retro City Rampage is one of the best indie games I’ve ever played. I CANNOT WAIT FOR THIS!!! Thanks for all the support and comments, everyone! Really appreciate it! I lied on the age verification for viewing this video. Uh oh. Im sorry Sony, i cracked your super secure system. a plat' for both of us " a buyer and a developer "